Anyone in the world can create a podcast which means there are a lot out there. Podcasts tend to be made by passionate people that want to share what they know. From talk show style to interviews to news updates, there’s podcasts out there for everything including several podcasts for small businesses and entrepreneurship. 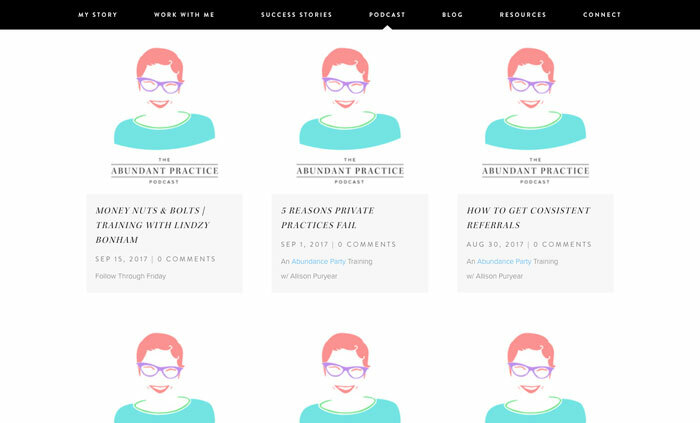 But what about podcasts specifically for building your private practice? Those exist too! There are a handful of podcasts that are specific to private practice building and three in particular that are quite excellent and worth a listen. But first, what are the characteristics of a good podcast? Contagious passion – the hosts have to be passionate about their topic. Consistent – the podcast has to release new episodes on a regular basis with fresh content. Actionable advice – it’s great to hear stories and laugh at jokes, but really, we need to be able to take what we learn and put it to action. Some podcasts are better than others at delivering advice that you can actually use. Great guests – if the podcast is an interview style, the guests of the podcast have to be experts that don’t hold any juicy tips back. Generous, knowledgeable guests are key to a good interview style podcast. Not too salesy – most content marketing exists to convert you to their tribe and get you to purchase something. Even if this is the case, having a lot of ads or a lot of pushy sales pitches in every podcast is not ideal. 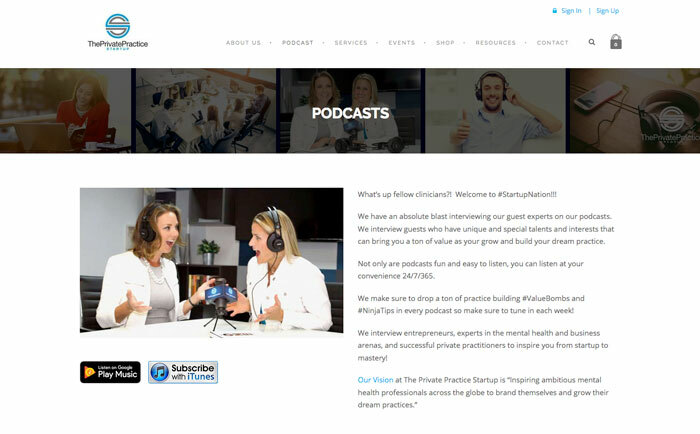 Creates a supportive community – a good podcast gives you informational, inspirational, content but a excellent podcast may even extend to having some sort of community online where you can connect with other listeners and share further insights and support. Marketing consultant and website copywriter, Juliet Austin, and relationship counselor, psychotherapist, and Australia Counselling founder Clinton Power team up to answer your marketing questions about private practices and natural health businesses. 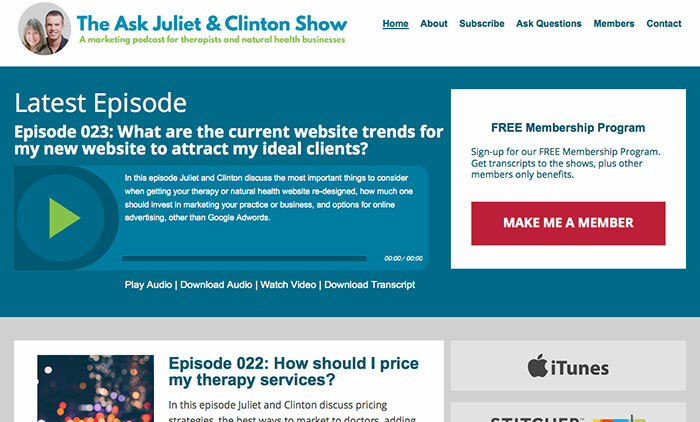 Juliet and Clinton answer some of the most difficult questions such as pricing your therapy services, the fastest way to get website traffic, and even how to start a podcast. Love: This podcast is not fluffy, and that is a great thing. Juliet and Clinton have a way of getting straight to the heart of the topic and cover lots of ground per episode. The video version of this podcast is awesome too and they’ve just launched a free membership program. I also felt like a bit of a celebrity when they mentioned me in the episode 8 shownotes (thanks guys!). 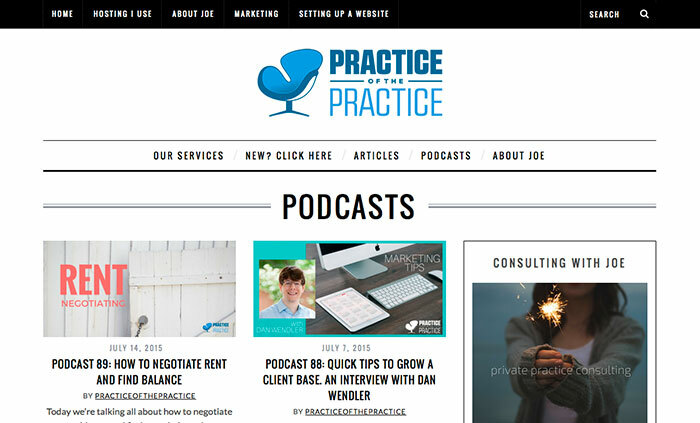 Counselor and private practice consultant Joe Sanok is the one behind the Private Practice Podcast where he shares what he’s learning about business, marketing, and private practice. He often has interviews other professionals in the practice building space. He’s interviewed the fantastic Julie Hanks about how to get media attention, thought leader and entrepreneur Patt Flynn about passive income for therapists, and security expert Roy Huggins on digital security for therapists. Love: Joe Sanok doesn’t hold back. He’s honest about his life and his private practice journey and you will appreciate his open honesty. He brings this to every podcast he does. He’s also recently launched another podcast on how to become a consultant. No doubt it will also be excellent. 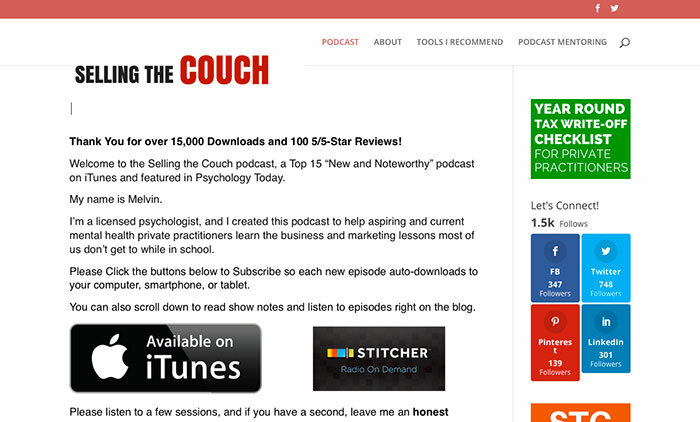 Melvin Varghese is a licensed psychologist who started his podcast to help new and current mental health private practitioners learn the business and marketing lessons that they didn’t learn in school. Melvin usually has guests on his podcast that share their vision, journeys, and wisdom. Some stand out podcasts include one where he gets super insightful practice building tips from an intern, found a pinterest expert to share pinterest insights that will help you get more website traffic, and counselor, coach, columnist, and all around awesome person Michael J. Formica to spill his guest blogging and profressional blogging tips. Love: Melvin put together a FB community of the same name where you can connect with him and other listeners. Is it cheating to include Clinton Power twice? 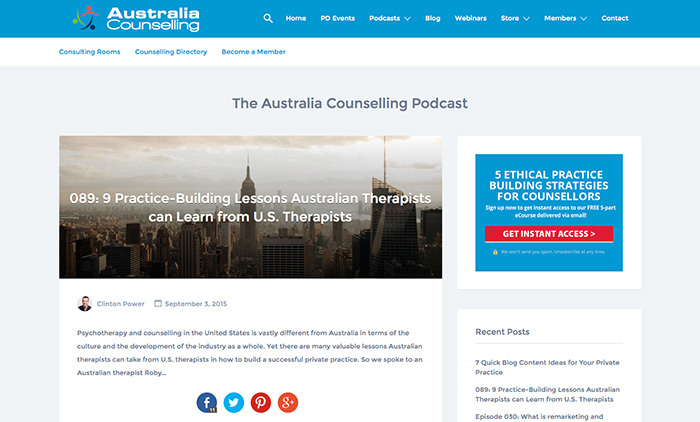 So he does this great podcast with Juliet Austin that was listed above and also used to do another one for Australia Counselling which is a counselling directory in Australia. Even though it’s located there, and sometimes focuses on Australia-specific topics, there are valuable tips for everyone. For instance, check out this one on starting an email newsletter. There’s also a fun one about different tools you can use to save time and money as well as starting multiple income streams as a therapist. Love: If you haven’t heard his voice before, Clinton has the most calming voice ever! Love hearing him talk, giving out all of this high value information for therapists. As any podcast listener will experience, there are no enough hours in the day to listen to everything! So we must be discerning with what we choose. 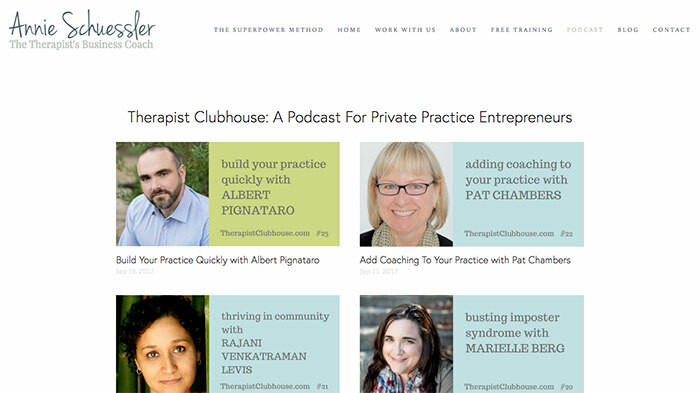 Are there other private practice building podcasts out there that deserve a listen? You tell me. What podcasts have you been listening to? What are your favorites? Let me know anytime by tweeting me or getting in touch. Would love to hear from you.